Hudson, Douglas. "Dakelh (Carrier)". The Canadian Encyclopedia, 05 October 2018, Historica Canada. https://www.thecanadianencyclopedia.ca/en/article/carrier. Accessed 23 April 2019. 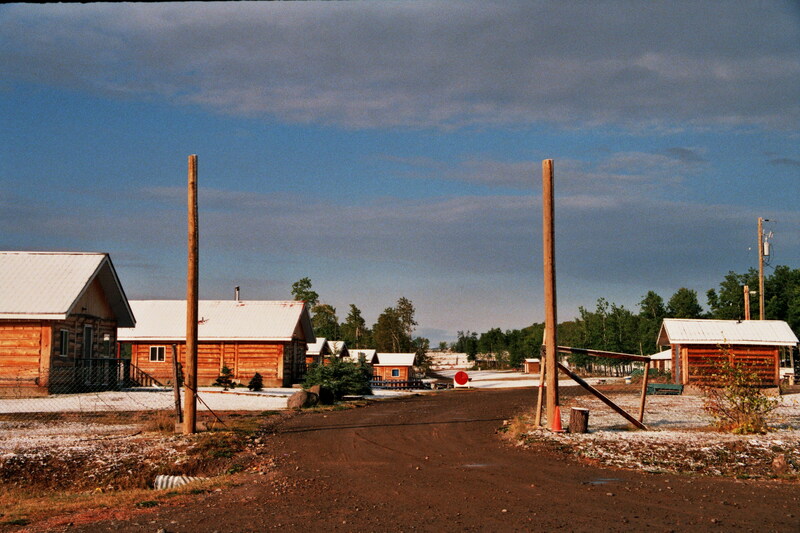 Cabins on Saik'uz First Nation, along Nulki Lake, 2006. Saik 'uz First Nation is a Dakelh (Carrier Dene) community. 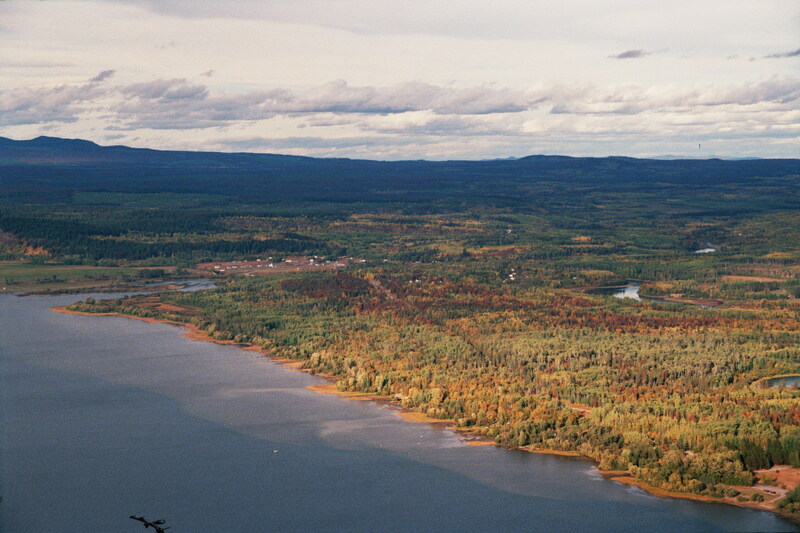 Nadleh Whut'en First Nation (part of the larger Yinka Dene (Carrier) Nation) and Fraser Lake, view from Mt. Fraser, 2006. 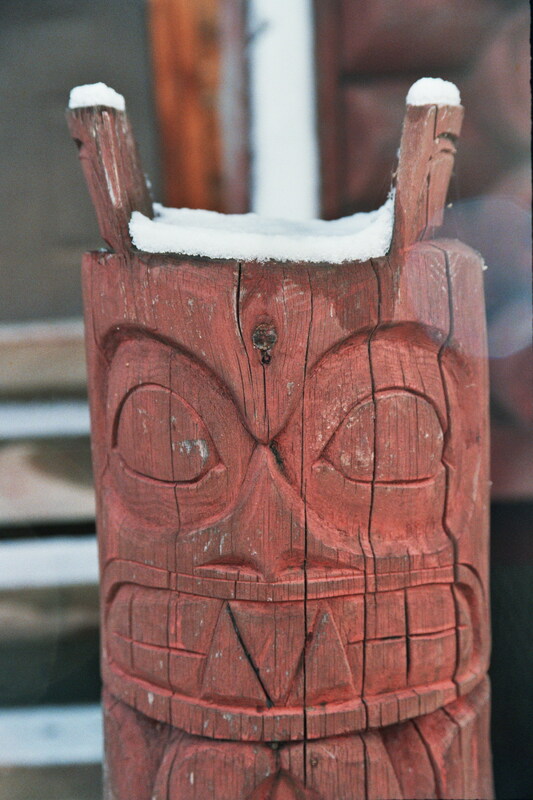 Small totem outside Saik'uz First Nation Potlatch House, 2006. 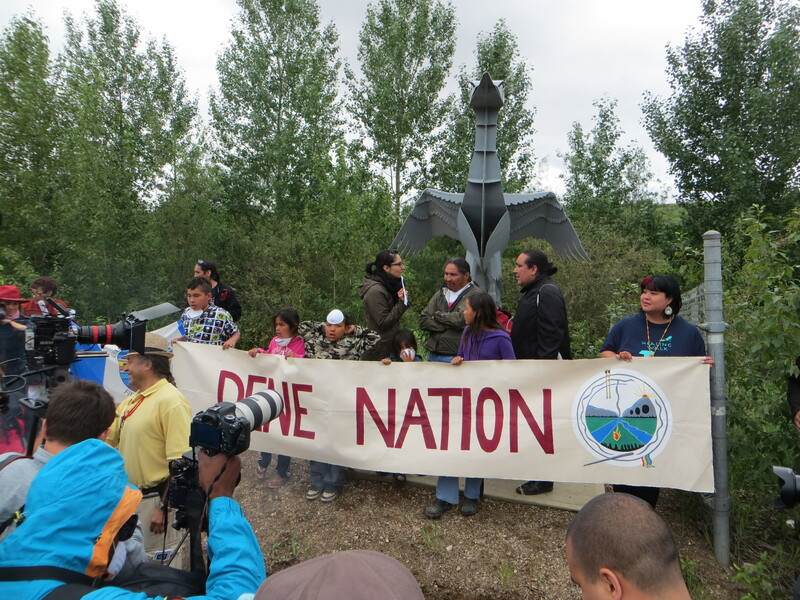 Saik&aposuz First Nation is a Dakelh (Carrier Dene) community. Dakelh winter villages were mainly located at the outlets of lakes or the confluences of rivers, or adjacent to strategic river canyons. 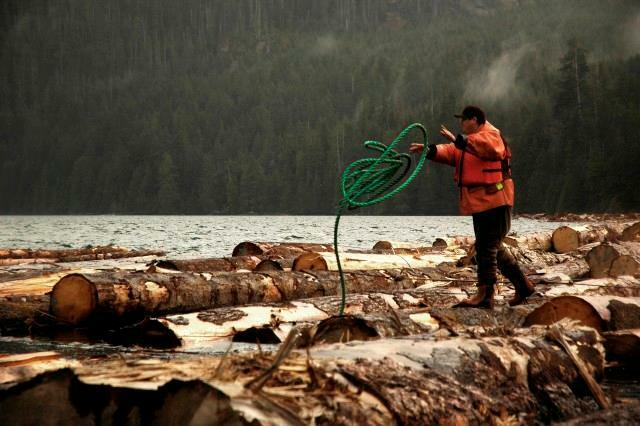 The traditional economy of the Dakelh was based on fishing, especially salmon and lake fish. Salmon fishing was carried out by using weirs (enclosures) across river mouths or by spearing salmon along rivers. The Dakelh also hunted large and small game, including bear, marmots and beaver. Caribou was particularly important to traditional ways of life until the mid-1800s; moose became similarly important after 1900. They gathered berries and plants to supplement their diet. The Dakelh used coastal trade routes to exchange hides, dried berries and meats; the routes were known as “Grease Trails” because many of the products traded along these routes were created using fish oils or grease. The Dakelh also had extensive trade ties with neighbouring groups, such as the Nuxalk, Gitxsan and Sekani. Lower Dakelh social organization was based on bilateral kinship groups centred on extended families consisting of brothers, their wives and children, and married sons’ families. Each group (known as a sedeku) was associated with a hunting territory and fishing and gathering sites. Upper and Central Dakelh had matrilineal descent groups or clans associated with resource-use areas (known as keyoh) and fishing sites. Heads of kinship groups and clans were known as deneza. Potlatches, the ceremonial distribution of goods and food, were held by clans to commemorate deaths, the inheritance of names and other special occasions. Members of each community were connected by extensive kinship ties which served as a framework for the inheritance of traplines and the exchange of goods and services. 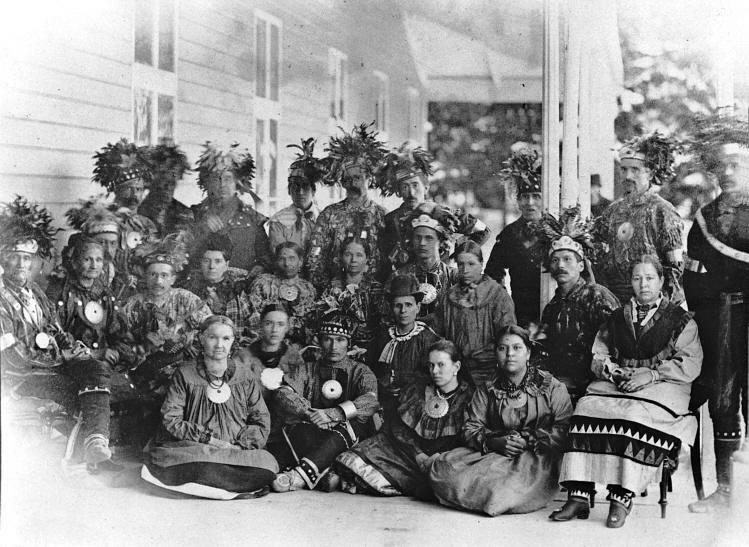 Oblate missionaries established a mission at Stuart Lake in 1873 and discouraged potlatches and other customs. Alexander Mackenzie and other fur traders of the Northwest Company	were the first Europeans to enter Dakelh territory in 1793. (See alsoFur Trade.) In order to get to this area however, they had to pass through Sekani	lands, and therefore learned about the Dakelh from the Sekani. It is for this reason that the Sekani name for Dakelh — Aghele — is the name Europeans translated and used to refer to the Dakelh. After the establishment of fur trade posts in the Dakelh area in the early 1800s (e.g., Fort St. James at Stuart Lake in 1806), the Dakelh traded salmon and furs to fur-trading companies (North West Company until 1821; the Hudson’s Bay Company after 1821). Because of a mission and trading post located at Stuart Lake, Fort St. James became an important centre for seasonal gatherings of Dakelh from throughout the region. Diseases such as smallpox and measles in the 1800s and influenza	in 1918 reduced the Dakelh populations, which reached a low point in the late 1920s. Reserves were allocated in 1871 and in the 1890s. After the completion of a railway line in the Northern Interior in 1914, the Dakelh became involved in logging and seasonal wage labour while maintaining hunting, trapping and fishing activities. This pattern remains important in some Dakelh communities. By 1911, weirs (enclosures) had been banned from use on salmon streams in the Fraser River and Skeena River	watersheds; in 1913–14 rock slides in the Hells Gate section of the Fraser River severely reduced the amount of salmon reaching the Stuart Lake and Fraser Lake area, resulting in increased use of lakefish, hunting and trapping. A. Mills, Eagle Down is Our Law: Witsuwit'en Law, Feasts, and Land Claims (1994). CARRIER SEKANI TRIBAL COUNCIL Explore their official website to learn more about this organization. CARRIER CHILCOTIN TRIBAL COUNCIL Learn more about the CCTC on this site.